11/13/18: The U-M IRBs have posted Informed Consent templates updated for the 2018 Common Rule on their websites. See References and Resources for links. The intent of these changes is to facilitate the subjects' understanding of the proposed research and also ensure that they understand how their data and biospecimens may be used. The preamble to the Final Rule (revised) lists five (5) factors as suggested "key information" that would likely assist a potential subject in understanding the nature of the project and in determining participation. How a study team applies the "key information" requirement, and to what level of detail, will depend on the complexity of the research project. 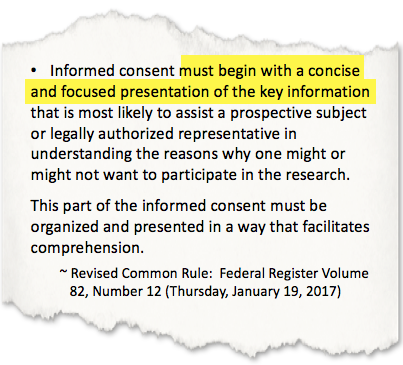 Many social/behavioral research projects already employ a brief informed consent document, so including a "key information" section may be redundant. The Final Rule preamble includes some considerations regarding the application of this requirement, but further federal guidance is expected at a later date. If you have questions about how to apply the new "key information" requirement for a particular project, contact your U-M IRB for advice. Use of identifiable information/biospecimens to identify potential subjects (i.e., screening for recruitment purposes) is allowed without informed consent under certain circumstances. A waiver of consent will no longer be needed for these screening activities. For federally-sponsored clinical trials, a copy of the consent form must be posted to a "publicly available, federal website" (TBD) post-recruitment and no later than 60 days after the last study visit by any subject. "Seeking prospective consent to unspecified research." For full details about "Broad Consent" including the requirements (in addition to tracking), limitations, and considerations for use, see SACHRP's Recommendations for Broad Consent Guidance. Note: For studies designed to collect identifiable data and/or biospecimens solely for the purpose of maintaining a repository, the study team may find it useful to employ a specialty informed consent template (e.g., biorepository template). The U-M IRBs have posted updated informed consent templates to their respective websites (see links in References & Resources below). Study teams should begin using the updated informed consent templates as soon as they are available on the websites. 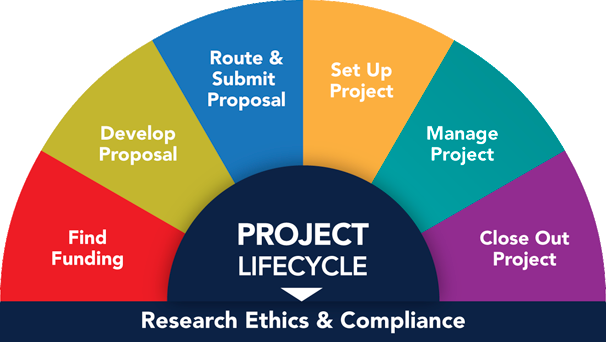 Section 10, Informed Consent, of the IRB application in the eResearch Regulatory Management (eRRM) system will be reorganized to help investigators select the correct informed consent category and to reflect the other consent-related regulations (e.g., waiver criteria). Due to the differing nature of the research and the volume of approved studies, the U-M IRBs are taking separate approaches towards transitioning existing studies to comply with the revised Common Rule, including any updates to informed consent documentation. Contact your U-M IRB for further information. IRBMED has specific guidance for transitioning existing projects reviewed under their purview prior to the proposed January 21, 2019 effective date. See the IRBMED's Transition to 2018 Regulations website for complete details. New studies submitted for IRB review after January 21, 2019 must utilize an updated informed consent template to ensure compliance with the revised Common Rule. IRB applications submitted shortly before January 21, 2019 may not be reviewed in time to qualify under the current human subjects protection regulations. Applications undergoing the review process at the time of transition may be returned to the study team to update the informed consent elements. U-MIC Presentation: IRBMED Informed Consent Changes Under the Revised Common Rule (2018) [Download] Overview of the changes to the Informed Consent process and documentation for IRBMED reviewed studies under the proposed 2018 revised Common Rule.